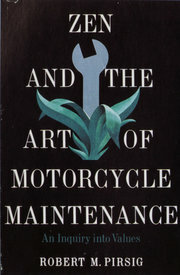 I read Bob Pirsig's unique book "Zen and the Art of Motorcycle Maintenance" at a time in my mid-life when New Age thinking still held sway and self-realization was my goal. It still stays with me as an extraordinarily memorable read, yet what this book of ruminations on changing times surfacing while biking with his 14 year old boy and an adult friend through the heart of America actually means I still cannot be sure. Years later a Canadian writer from Toronto travelled Pirsig's whole route, also on a motorcycle. His trip reminiscences, inter-weaved with his views on Pirsig's philosophizing, reinforce for me the one-of-a-kind weirdness of Pirsig's take on life seen through the lens of motorcycle care while riding among strange places with difficult companions. Perhaps one reason I retain after so much time surprisingly strong recollections of Robert Pirsig's ramblings lies within this quote from the NY Times obituary linked to at the beginning: "Mr. Pirsig’s plunge into the grand philosophical questions of Western culture remained near the top of the best-seller lists for a decade and helped define the post-hippie 1970s landscape as resoundingly, some critics have said, as Carlos Castaneda’s 'The Teachings of Don Juan' helped define the 1960s". This 'post-hippie 1970s landscape' was what I encountered when I arrived in North America in 1971. A displaced* person's first few years in a strange new land are usually well-remembered.